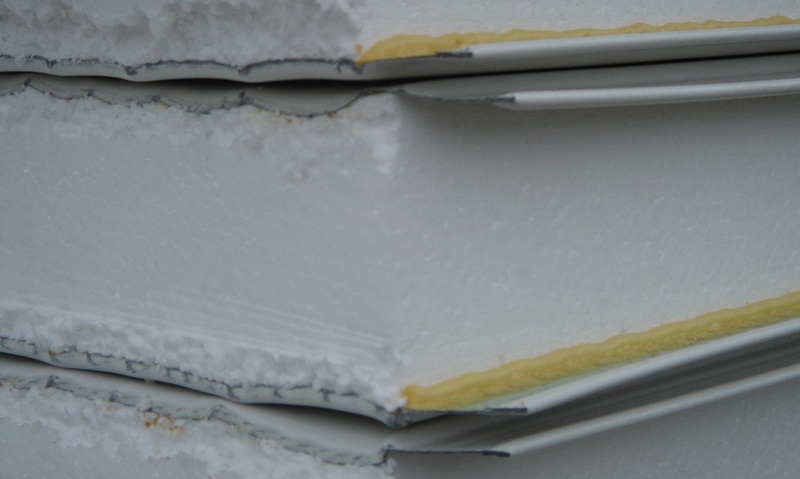 Rigid PU foam used in insulation boards or panels in construction applications are generally required to have a specified fire rating. One of the ways of achieving the required fire resistance is to modify the PU foam to produce Polyisocyanurate (PIR) foams. In PIR foams an excess of MDI is used so that the majority of the isocyanate groups are polymerised to form isocyanurate ring structures. Pure PIR foams tend to be brittle and so it is common practice to modify the PIR with some PU content. PIR foams are particularly important because of their resistance to high temperatures and relatively low combustability. A very wide selection of foam-cored panels and insulation boards is possible in which the rigid PU or PIR foam is bonded to the facing materials to form strong composites. The majority of these laminates are made by injecting foam into pre-assembled panels in a press or in a continuous lamination process. The facings may be flexible (eg aluminium foil or coated paper) or rigid using plaster board on one side for instance. The panels are often made with metal facings on both sides.